This post comes on the back of a pal’s Facebook status update at the weekend. He had been in his loft and brought down a box of tapes. 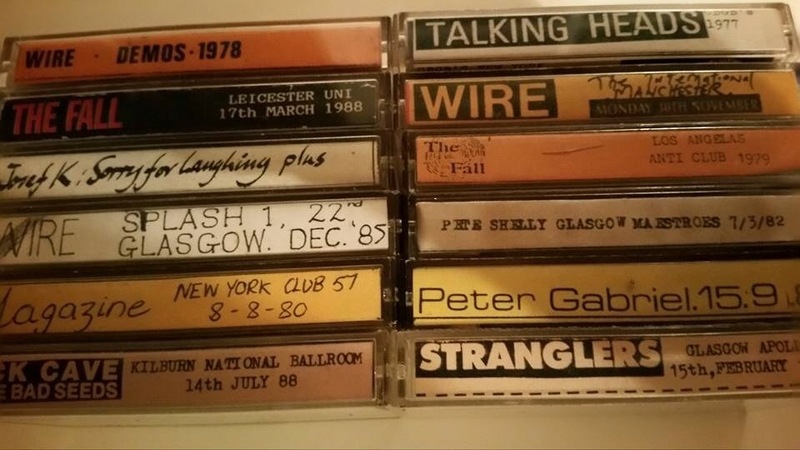 Not just any tapes, but a collection of live bootleg tapes. Bought at record fairs and market stalls, under the counter in independent record shops and from the back of the music press, they were all the rage in the mid-late 80s. I had tons of them. Some of my own might also be in the loft, but I suspect I gave the better ones away and skipped the rest when I moved home a decade or so ago. Sacrilege, I know. And a wee bit stupid too. Not Iain. He’s kept his, and there they were, proudly on display, neatly filed and cared for (out of sight in the loft, but clearly cared for), preserved in all their glory for 30+ years. The spines, all faded primary colours and badly photocopied typeset were like a post-punk hall of fame; Wire. Josef K. The Fall. Pete Shelly (sic). The gigs, long-since faded memories, lived on in the ferrous oxide therein. 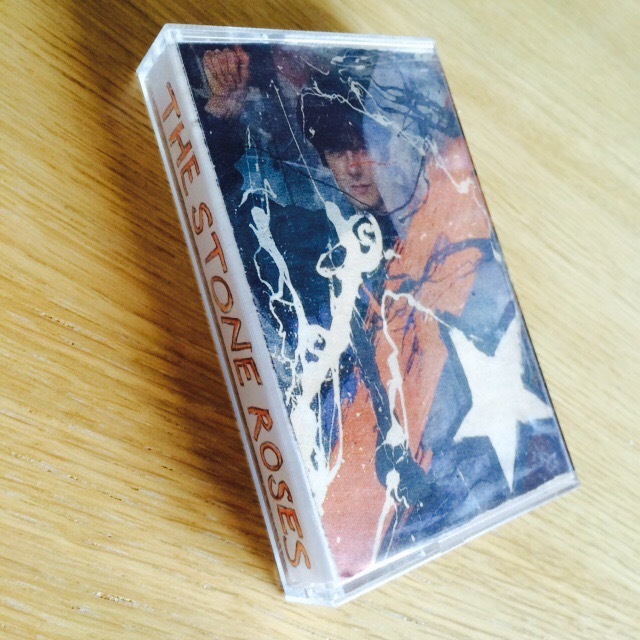 Bootleg tapes tended to come in two forms – ‘audience quality‘ or ‘excellent quality‘. ‘Audience quality‘ was exactly that. Taped on a portable dictaphone from under the lapels of a donkey jacket, they had a sound akin to the band playing underwater 60 miles away. On playback, sometimes the only clue you’d have as to the song being played would be the fevered shouts from the audience as the band played one of their biggies. Unless you’d been there though, 9 times out of 10 you couldn’t be certain that you were listening to the track in question. 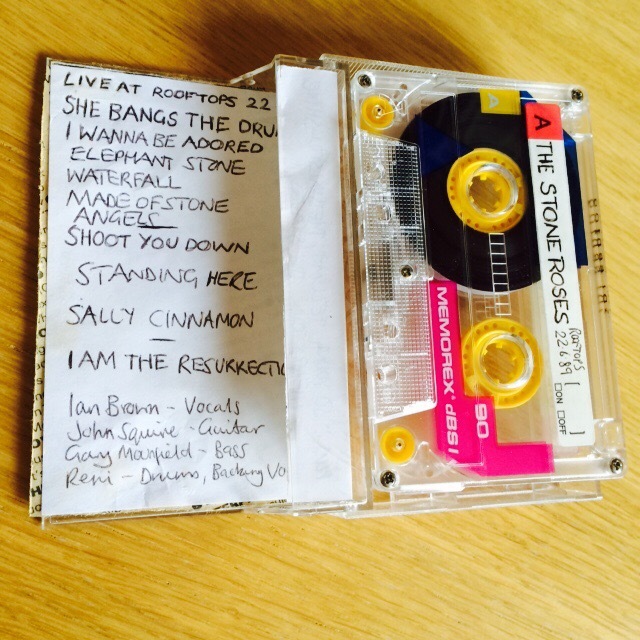 My one brief foray into bootlegging began and ended with The Stone Roses. I taped their now legendary Glasgow Rooftops show, just as the band were on the cusp of going massive. Stuffed down the front of my jeans until the lights went out, my dad’s clunky old dictaphone was called into action. The wee blinking red light meant it was recording. Looking furtively to the side I noticed a guy about the same age as me looking at the machine in my hand. He nodded conspiratorially and gave me a wee thumbs up. At the end of the gig he found me and gave me his address, with a promise to send me some bootlegs in return. The Stone Roses were absolutely on fire that night, a terrific gig. I couldn’t wait to get home to play the tape. Sorry if it was you who gave me your address. Your memory of a great gig would’ve been ruined forever. I truly did you a favour. Home Taping Is Killing Music indeed. A tape marked as ‘Excellent Quality‘ was nearly always misleading. This usually meant the taper had found a quiet spot away from the whirling masses, away from flying elbows and shouts for ‘Hand In Glove‘ or ‘Feeling Gravity’s Pull‘ every other song. The tape still sounded like the concert was playing underwater and 60 miles away though. And get this! It was actually a considered theory that the best way to listen to a bootleg such as this was to play it in one room while sitting in another! Imagine that! I did it, too! Listening to Dylan mangle ‘Visions Of Johanna‘ in the living room while I cooked the tea in the kitchen. Sounded great as well! These tapes are a whole subculture, a forgotten relic from the days of yore. Young folk nowadays, with their video phones and social media and whathaveyou just wouldn’t understand the lengths you had to go to obtain a crappy memento from the best gig of your gigging life. But I bet if you’re of a certain age, they’re still great to get out and look at, and dare I say it, play them, now and again. One of Iain’s tapes was of Magazine. Before I knew the band, before I had heard ‘Shot By Both Sides‘ and was bitten by their music, I had heard of Howard Devoto only through reading NME. He was distinctive to look at, a bit weird I thought, and not really someone whose music I presumed I’d like. I wish I hadn’t been so stubborn and narrow-minded as a teenager. The saddest thing I have ever seen was in the Virgin Megastore on Glasgow’s Union Street. It must’ve been 1987/88. There, sat at a table in the front of the bay window and facing inwards to a crowd of no-one was Howard Devoto. He was surrounded by a sea of books and/or LPs (I can’t quite remember) that no-one wanted to buy or get signed with a personal message. He noticed me noticing him and he gave me the saddest expression – his mouth may have been upturned into a smile, but his eyes were pleading. ‘Help!’ “Me!’ ‘Now!’ Of course, I ignored him and went back to looking for the New Order section. I’ve felt bad about this to this day. I wish I’d gone up and at least said ‘Hello‘. I’d love to think that if I ever met Howard and told him this story, he’d reply the same way he does when he makes his cameo in ‘24 Hour Party People‘ – “I have absolutely no recollection of this ever having taken place.” You never know. Anyway, here‘s Howard and the rest of Magazine giving Sly Stone‘s ‘Thank You Falettinme Be Mice Elf Again‘ a good post-punk going over. S’all about the bass, ’bout the bass…. And here‘s Sly’s original, all finger poppin’, booty shakin’, dripping, brooding funk. If you don’t like Sly there’s just no hope for you. None at all. Ha! Craig I was working that day in Virgin U.St. We tried everything to get punters over to his table. In the end, we had to get members of staff to put jackets on and pretend to be Joe Public in order to try and generate interest. Think it was for Luxuria and/or his biography. Really felt bad for him. Aw man. I really wish I’d said something to him. Ignorant teenager. I bet he’s online somewhere. I think one of us should ask him. 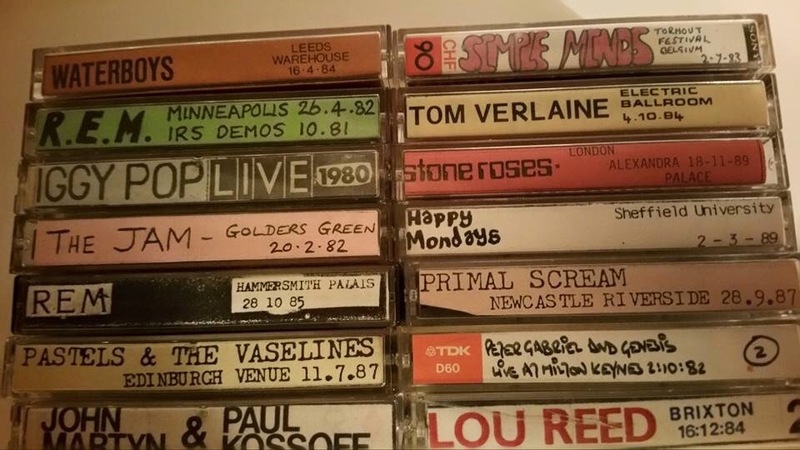 I bought quite a few bootleg tapes at the Liverpool Uni students union before I learnt the lesson about sound quality. Cheers Adam. Aye, you learn the hard way! McLellan Galleries and Mitchell Library record fair. Probably the same source though. We all had them! The McLellan Galleries, I had forgotten about there. Picked up. Quite a few anarch punk records from there. Great read about those concert tapes. We’ve all got some somewhere. I seem to remember them being cheap, so why the hell did that not put us off? So you buy one, it was crap, but you bought another in the hope that the previous experience was a one-off. It was also crap. One more…one more…all crap. Especially that Stone Roses one I got…………. Apologies. I’m new to your blog, but this was a one of the best reads I have had in a long time. Thank you. Och, thanks Brian. I appreciate you taking the time to leave a comment. I’ll add your blog to my links when I next update.